The EPA is accepting nominations according to this Saipan Tribune article for EPA's region 9 awards. The Tribune article isn't quite correct though: EPA seeks to honor environmentalists outside of EPA (not outside of the US). Anyone here in the CNMI or elsewhere is eligible. You can nominate your choices here. The categories for nominations include 1) Environmental, community and non-profit; 2) Federal, tribal, state, or local government; 3) Individual; and 4) Business, industry, trade or professional organization. You'll need the full name, address, and phone number for any nominee, and be willing to give the same information about yourself. You'll also need to write 500 words in support of the nomination. I can think of many, many people who should be recognized here for outstanding contributions this year--all related to promoting the designation of the Marianas Trench National Marine Monument. I could add more: Jay Nelson and William Aila, as well as many of the hard-working supporters here in the CNMI like Lauri, Agnes, Chailang, Cinta, Ruth, Andrew, Ed Salas, Tina, Captain Carl, Kimberly, Brian, and more. But my short-list remains as above. Deadline for submitting nominations for the EPA Region 9 awards is 2/8/2009. I hope you write up some nominations. There are some very deserving people, especially Ken. I'm working on it. I haven't done Ken's yet, or Ike's. Or Friends'. But I'm getting there. On Wednesday, I submitted a nomination for Angelo. I didn't keep a copy of my on-line submission, but it was a glowing recommendation. 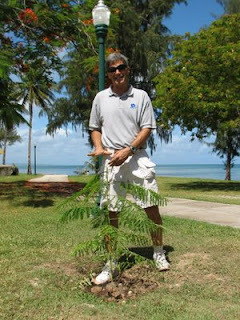 Ken Kramer actively promoted the creation of a National Marine Monument in the waters around the CNMI. He resigned his job as the USDA-RC &D Coordinator to work on the monument promotion as a volunteer. He shared an enormous amount of information about the risks to our environment and the state of our oceans, the benefits of marine sanctuaries, the weakness of of our current system, and the opportunities available to the CNMI if President Bush were to designate a monument. He wrote 15 letters to the editor and collected 750 of the 6,000 signature on petitions supporting the monument. 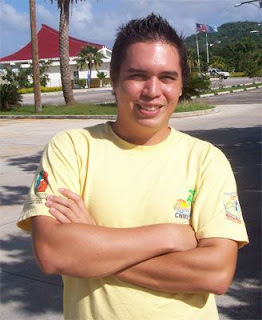 He wrote articles that were published locally in the Island Locator magazine. As a vocal supporter for marine conservation and a proponent of the Monument, Ken was a lightning rod for criticism and was attacked in the newspapers and verbally at meetings by opponents of the Monument. He didn't back down. He attended meetings and presentations about the monument, including meeting with White House officials (James Connaughton, Lyle Laverty, Sean Morton, Tim Keeney) who came to Saipan. He worked with Pew officials and William Aila, who were here to promote the monument. He joined as a member and worked with the other supporters in the Friends of the Monument organization. He met with business leaders, getting their signatures on petitions and encouraing them to write letters, also. His hard work contributed significantly to the eventual success of the campaign. The community is much better informed about marine issues and very supportive of the monument; some of the government leaders who were opposed have joined the ranks of supporters; and most importantly, the President has designated a Marianas Trench National Marine Monument. Ken is a role model and living proof that dedication to an environmental cause through education and personal contact can transform a community. Now I still want to nominate Ike and Friends of the Monument. I hope others here in Saipan are submitting nominations. Even if you're nominating the same people, especially if you're nominating the same people that I am--that would be excellent! I was thinking about this and would bet good money that the opposition is nominating themselves. Angelo, you must be kiddig. What accomplishmets would they claim? Reducing the total area of the proposed monumet? Getting rid of the protection from sport fishing? Leaving open the possibility that the monument may be give to Wespac for management under NOAA?